A Fire Upon the Deep blew me away, and its prequel, A Deepness in the Sky, impressed me even further. Through these two books Vernor Vinge set and raised the bar for what I considered an amazing science fiction book to be. So it's with shame and hesitation that I give The Children of the Sky the amount of criticism I'm about to. First, the minor complaints I have (such as repeatedly using ridiculous terms like "frigging", "natch" and "craphead"). They're at least so minor I only wish to refer to them in parentheses. Done. ...as thrilling as all this action and speculation is, the reader is still going to feel an underlying itch for a broader canvas. This itch will manifest itself most vividly in chapter 24, almost exactly halfway through the book. The monitors on the Oobii show that the currents of spacetime have pulsed, and that Tines World is part of the faster-than-light realm again. The reader's heart jumps! Out into the Galaxy we fly! But no, it's not to be. The tide immediately ebbs, and we are again castaways with a sigh. In a podcast interview earlier this month, Vernor Vinge explained that his first attempt at a sequel to A Fire Upon the Deep began with the full text of The Blabber (a short story he wrote before A Fire Upon the Deep), which takes place further into the future where our main characters have managed to rejoin the mighty space-fearing civilizations of "the beyond". So we know Vinge has at least thought about where the story could go next and might be able to easily jump into it in the near future. The Children of the Sky is a good book, and shouldn't be the least bit disappointing if you go into it knowing what to expect (a low-tech, middle book in an unfinished trilogy). 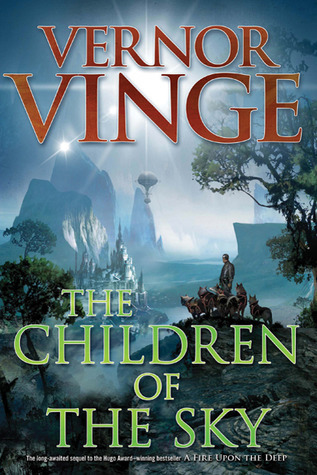 I'll definitely be reading whatever Vinge publishes next, but I hope (against hope) it's a sequel to this sequel. Sign into Goodreads to see if any of your friends have read The Children of the Sky.